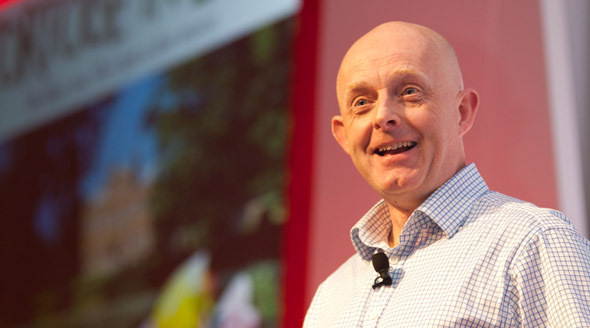 RDO is delighted to confirm that Guy Browning will give the opening Keynote on day 2 at this year’s conference RDO6 Embracing Change, 17-19 September 2015, Marbella, Spain. Guy has two key characteristics necessary for great business communication: a thorough understanding of commercial issues and a highly developed sense of humour. Known as the ‘David Attenborough of the business jungle’, he is the creator of The Guardian’s Office column, presenter of Small Talk on Radio 4, and author of a slew of bestsellers. His latest book is The Pocket Guru, a brilliantly accessible guide to enterprise. Guy’s books include Weak at the Top (the uncensored diary of the last cavemanager), Never Hit a Jellyfish with a Spade (how to survive life’s smaller challenges) and Maps of my Life, which he describes as an autobiography without the bad bits. Guy has also brought a new approach to cinema, writing and directing his first film Tortoise In Love, a low-budget romantic comedy financed by and starring locals from his own Oxfordshire village.